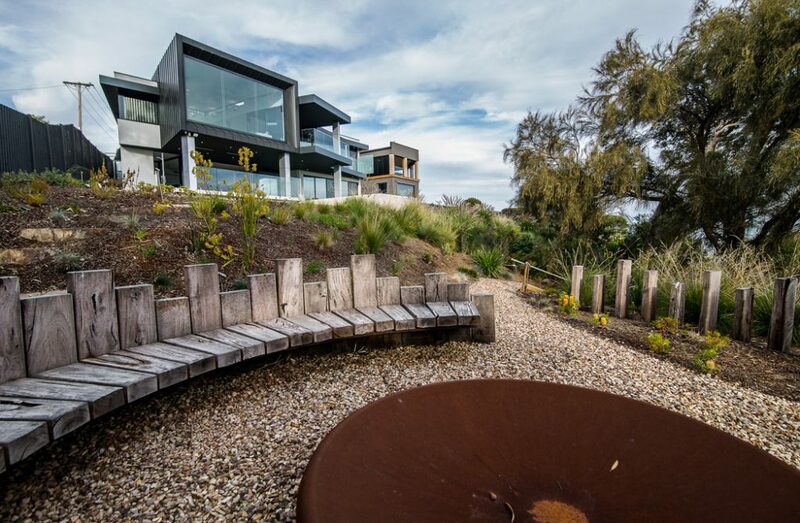 A new build by Robert Rolls comprising three levels cut into a steep seaside site at Somers on the Mornington Peninsula, this project commenced with a bulk excavation, boundary piling and retaining walls. The lower ground floor is on a slab on the ground with core filled blockwork, which is cut into the hillside and made up of a home cinema, steam/powder room and an indoor/outdoor living space. 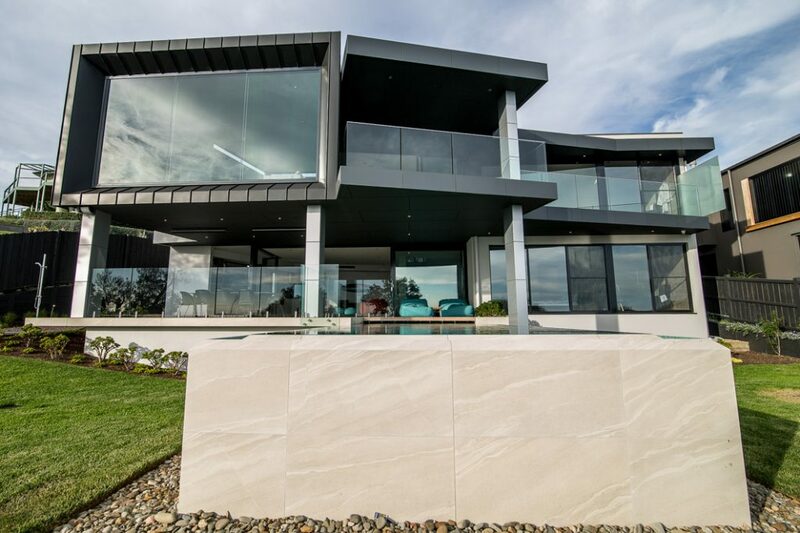 The area can be opened up with expansive sliding doors, bringing together the swimming pool, outdoor kitchen and living areas. The next two levels were originally designed as a suspended slab and block construction. This was changed to lightweight timber and steel construction as part of cost-saving measures. The midlevel includes the main entrance to the home and garage, which breaks the bulk of the structure from the streetscape and brings guests into the main living and kitchen area. The counter levered stairs allow view lines through to the bay and down to the pool. The upper floor encompasses a study/library and master bedroom, walk-in robe and en suite. The other three bedrooms are spread throughout the home, creating private spaces. A curved central wall provides a subtle spine to the home that also breaks the boundaries of the internal/external space with the reflective sheen of the external tile mirroring the internal white stair wall. 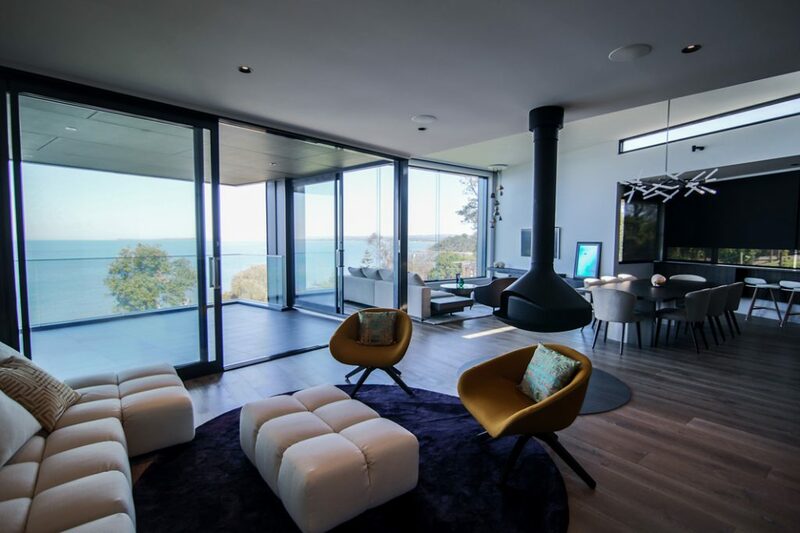 Every room in the house takes advantage of natural light and the spectacular location provides view lines through to the water. Some areas, including the study and guest bedroom, use secondary viewpoints through adjoining rooms. The study uses the highlight atrium windows and the main living room window to provide an additional view line to the water edge below. 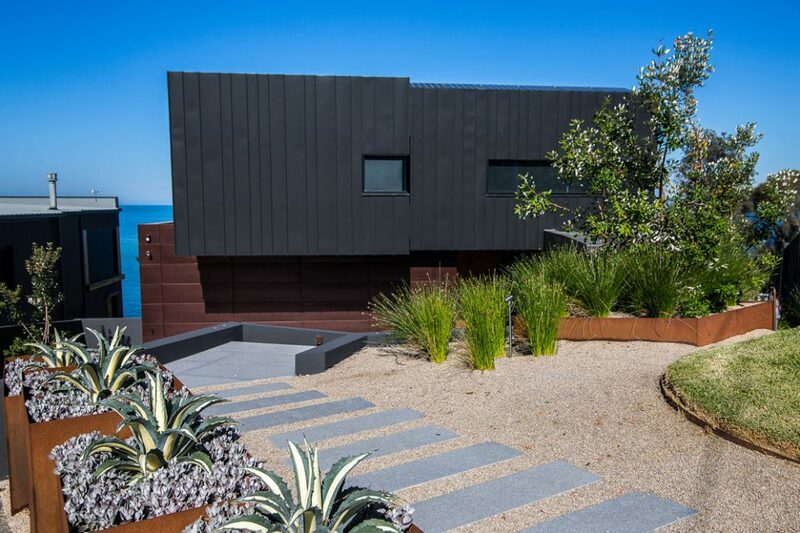 The house utilises external aluminium zinc cladding, alucabond, tiling and render, which provides a hardwearing, low-maintenance exterior. 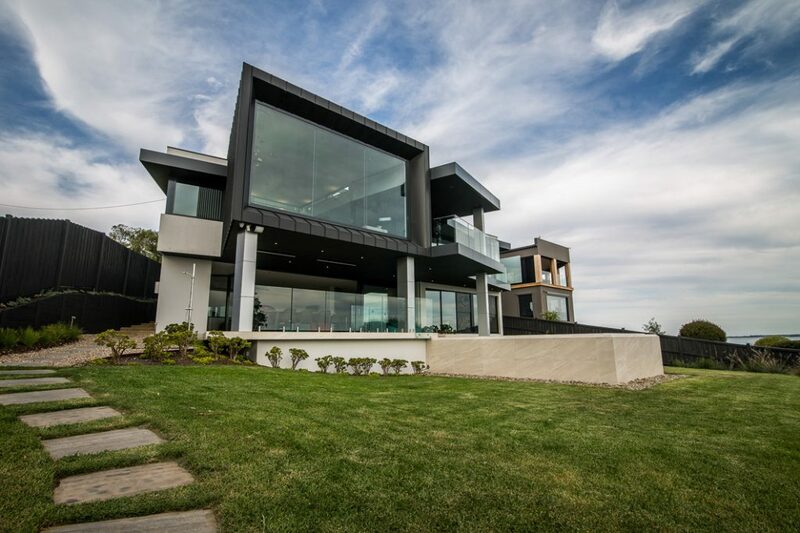 Given the extreme weather conditions a site like this experiences, the house is equipped to withstand the elements. For example, the balconies use a perimeter formed stainless steel trough to protect from windblown water ingress. Solid 190-kilogram baths were craned into adjoining rooms prior to the house being locked up to enable adjoining access to their final location. Large glazing aspects including windows and shower screen panels had to be strategically craned into position before access to areas was restricted or lost. Given the steepness of the site, there was limited access and restricted access as the structure progressed and a carefully planned, systematic approach was required to enable all aspects of the build to take place. The architect on the project was Selwyn Blackstone.